Norris Shores is a FireWise Community ! It is with great community pride we announce Norris Shores has achieved Firewise Communities/USA recognition status. We are one of only five communities in Tennessee to receive this recognition. The goal of the Firewise Communities/USA program is to provide residential structures in wildland-urban interface areas, such as Norris Shores, with the ability to survive a wildland fire without the intervention of fire-fighting forces. Our Norris Shores Neighborhood is now highlighted on the National Firewise Communities USA Website. Our community has been rated by the Area Forester as a “high hazard” area. Recently, we mailed a package to our homeowners containing information that will help you make your home more able to survive the threat of an approaching forest fire. Please take the time to review this valuable information. By taking appropriate actions now could make the difference between saving your home or losing it to a wildland fire. The Norris Shores Firewise Committee has been trained to offer free Home Hazard Assessments which evaluate the risk to your home in the event of a wildfire. Your participation is completely voluntary. The assessments rate the type of vegetation near your home, the topographic features of the area, and the type of home construction you have. The assessment takes about an hour to complete. We would like permission to walk around your house in order to complete the assessment (we do not need to go inside your home). You do not need to be at home during the assessment, although, the members of the assessment team would prefer to meet with you and discuss the factors of the survey, as well as give easy tips for making your home Firewise. All information collected and recommendations made will be kept confidential, and will be provided to you in a written follow-up letter, to better protect your safety and property. Or if you prefer, click here for a printable form to mail back to us. 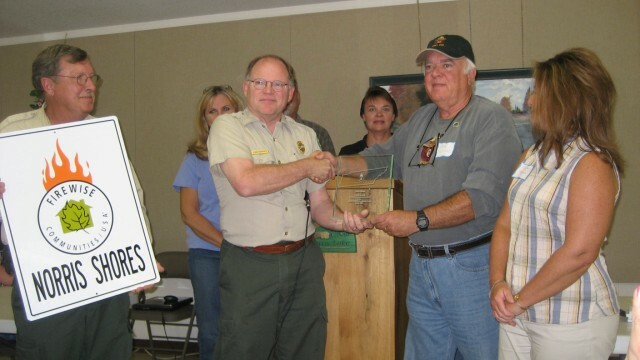 The Firewise Communities Program is a cooperative effort among federal, state, and private agencies to promote fire safety in wildland/urban interface areas, such as Norris Shores. The primary Firewise tenet is that it is unnecessary to lose homes or other buildings in wildfires IF those homes or buildings are built and maintained according to simple Firewise principles. Firefighters cannot be everywhere when a wildfire occurs, but if homeowners accept the responsibility for their own safety and follow Firewise suggestions, homes and buildings will survive wildfires without any fire fighters being there to protect them. We have learned that we cannot prevent wildfires from happening, but we can prevent loss of homes and other structures. Wildland staff from federal, state and local agencies provides our community with information about coexisting with wildfire, along with mitigation information tailored to our specific needs within Norris Shores, based on an on-site visit. The community assesses its risks and creates its own network of cooperating homeowners, agencies, and organizations. Becoming a Firewise Certified Community will provide the homeowners within Norris Shores a wealth of helpful information as well as individual home-site inspections, if requested, which should substantially decrease overall community wildfire risk/losses. It will allow us to apply for federal, state, and private grant money which can further be used for resident information/education purposes, equipment, and other means to reduce risks of wildfire to our community. It potentially could lead to reduced homeowner insurance costs. Our NSPOA Board of Directors has established our Firewise Community Committee for Norris Shores. Current members include Bob Swisher, Chairman, Laurie Oppel, Julie Graham, and Tammy Thomas. Our local Sharps Chapel Fire Chief, Chris Upton, has also agreed to participate. More information about the Firewise program can be found on the links below. Firewise Community information and brochures will be available at the Marina during our Annual Neighborhood Clean-up days. Check for updates on this web page and in future newsletters. NORRIS SHORES PROPERTY OWNERS ABOUT BURNING ! As you are probably aware, you must obtain a burn permit from the Division of Forestry for any outside fires between October and March. These permits are free, and can be obtained by calling the Division of Forestry office at Chuck Swan Monday thru Friday between the hours of 8 and 4:30. The number is 278-3348. But did you know…that all fires must be continually monitored at all times regardless of time of year? And did you know that you can be held criminally liable? Tennessee Wildfire Law 39-14-305. Leaving fire near woodland unattended. (a) It is unlawful for any person who originates or uses an open fire to leave such fire unattended without totally extinguishing the same within one hundred fifty feet (150’) of forest or woodlands or within one hundred fifty feet (150’) of other inflammable material, the setting fire to which inflammable material would naturally and proximately result in such fire being conveyed to forests or woodlands. (b) A violation of this section is a Class B misdemeanor, punishable by a fine up to $500 and/or 6 mos. in jail. (2) Starts a fire on such person’s own land, building, structure, or personal property and recklessly allows the fire to escape and burn the property of another. (b) Reckless burning is a Class A misdemeanor, punishable by a fine up to $2,500 and/or up to 11mos 29 days in jail. It is the property owner’s responsibility to ensure that any contractors, subcontractors, other employees, relatives, or lessees are aware of this law as joint liability may be an issue. Brush piles from clearing lots burning unattended overnight or for days is unlawful and will not be tolerated in Norris Shores!